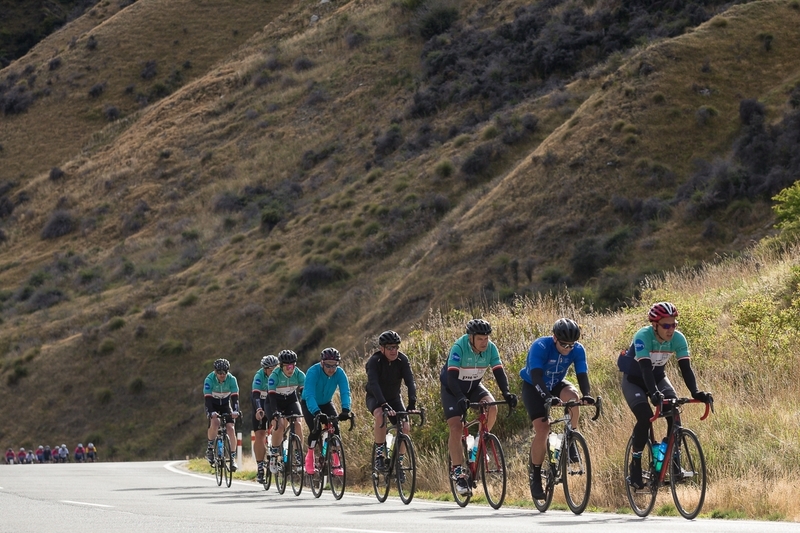 As our epic tour of New Zealand’s glorious south island draws to a close, your riders stirred in the pre-dawn as has become their daily ritual this past week. At breakfast one had a sense of the scale of the week by taking in the facial expressions around the room – the faces belied the exhaustion felt by each and every rider, but they also showed a hint of pride and continued to display the good charm that has been a hallmark of our time on the road together. It’s not often that you spend a week away with a group this size, sharing close quarters with someone new almost every night in addition to the pure logistics of sleeping in a different hotel each and every night. Yet none of these tests has forced even the slightest crack in our group – we have been united in our commitment to enjoying our time on the bike and our time together, to doing the best possible job of fundraising for our charity partners and to sharing in and building on the camaraderie of our peloton. Our day had one major challenge – the ascent of the Crown Range – ahead of us, but first we had to make our way up the Cardrona Valley Road. No doubt some of our readers will have been to Cardrona in the winter, and it’d be a special place at that time of year to be sure. However, it was our pleasure this morning to pull into Cardrona with the morning cloud-cover beginning to part, a cool breeze in our face and the late summer morning still offering some warmth and comfort. In these conditions, our brief stop in Cardrona was an absolute pleasure. When we rolled past the 1860s era Cardrona Hotel, and most of us wished we had time to stop and enjoy the hospitality available inside! With the alpine resort on our right and Snow Farm NZ’s cross-country ski trails to our left tall tales of ski-trips past and excitement about ski-trips future were over-heard amongst the group. We enjoyed freshly cut fruit, prepared and served by our ever-present, totally thoughtful and always pro-active support crew, before breaking into our teams to minimise our impact on traffic on these narrow mountain roads as we began our climb. The climb up the Crown Range began easily enough, but it constantly built and became more and more open to the headwind as we climbed. Making our way up and over the rolling hills in the lower half of the climb most of your riders settled into a rhythm as the groups stuck together, providing support and encouragement where required. Whilst the headwind persisted, the vertical metres began ticking away but the challenging second half of the climb was still ahead of us. As we rounded yet another twist in the road we could finally see the highway kick-up ahead of us and we knew the real work was about to begin. Speaking to several of our group a little later in the morning whilst taking water at the summit it was clear that many riders had reflected on the powerful story we had heard at last night’s function and drawn on this as a source of inspiration as they turned over their weary legs. As often happens on long climbs, just when you think you have reached the peak, you take another corner and all of a sudden you realise that there is some way still to travel – today’s climb up the Crown Range proved no exception to this rule and several riders where overheard commenting on their disappointment as they passed the false-peak. Reaching the summit shortly after, your riders were rewarded with a spectacular view across the valley below. In the distance we could see Queenstown – and the end was, quite literally, in sight. 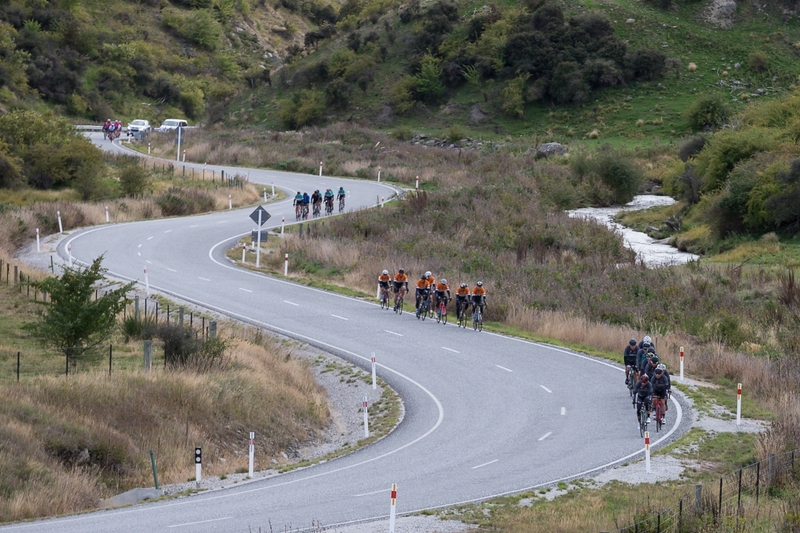 Having taken in the view and the opportunity for more than a few photographs, the peloton began the steep descent including seven switch-backs as we headed towards Arrow Junction at the base of the hill. With the climb behind us, we turned for the historic gold-mining town of Arrowtown - our final stop before our much anticipated finish in Queenstown, now just 20km down the road. Arrowtown is an historic village on the banks of the Arrow River with beautifully preserved and restored buildings at every turn. 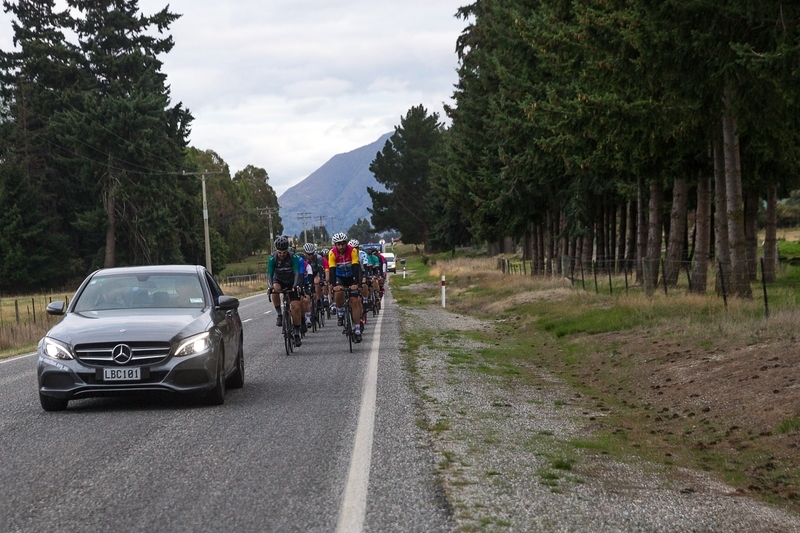 We lunched at the New Orleans Hotel before taking some time to say ‘thanks’ to our support crew and to each other at the picturesque Buckingham Green before the celebrations and family reunions in Queenstown. 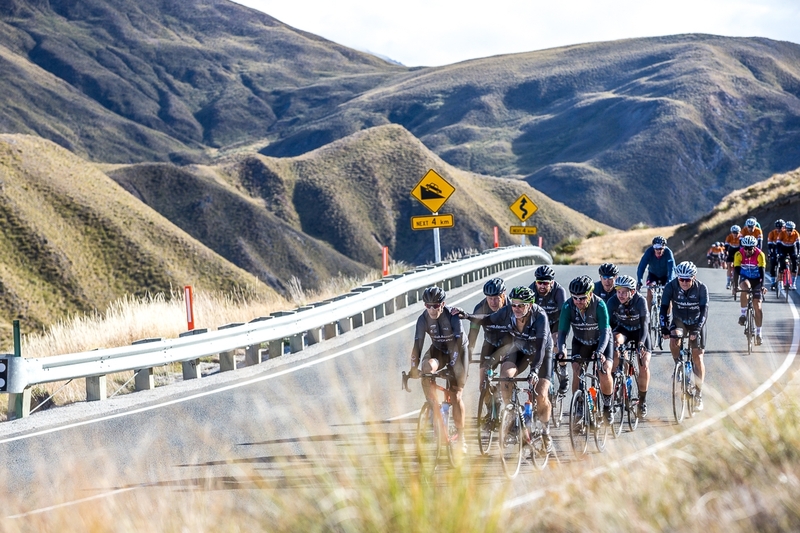 Before we knew it, we were back in the saddle and spinning through our last few kilometres – a few rolling hills to go, then the final descent into Queenstown and our wonderful lakeside finish. It was exhilarating to see a group waiting for us and applauding us across the line – there were familiar faces, smiles all round and the inevitable emotions of both achievement and relief. Our setting was postcard perfect, with blue skies, the crystal clear waters of Lake Wakatipu at our backs and a warming afternoon sun looking over us all. Amongst the smiles and the hugs were more than a few tears as the enormity of the week and our fundraising success hit home. Before we could move onto the formal end-of-event proceedings there was the small matter of packing up 57 bikes for the journey home to attend to. This mammoth task was undertaken in the same efficient and cooperative manner that so many of the tasks of the last week have been with Nashie and Tim Chadd providing expert assistance as required. Our final gathering was at the Lone Star Tavern, where we shared a quiet drink or two amongst ourselves and the family and friends who were able to join us. Spirits were high as recollections of the week were shared and comparisons of saddle sores and tired legs began. Michael Byrom spoke passionately about his pride in our group and his desire that we always remember the origins of Chain Reaction. Of course, time doesn’t stand still and Michael also asked that we consider, in the coming weeks and months, what we can each do to ensure that next year is at least as successful as this year has been. A final thank you, to you, our readers and supporters. 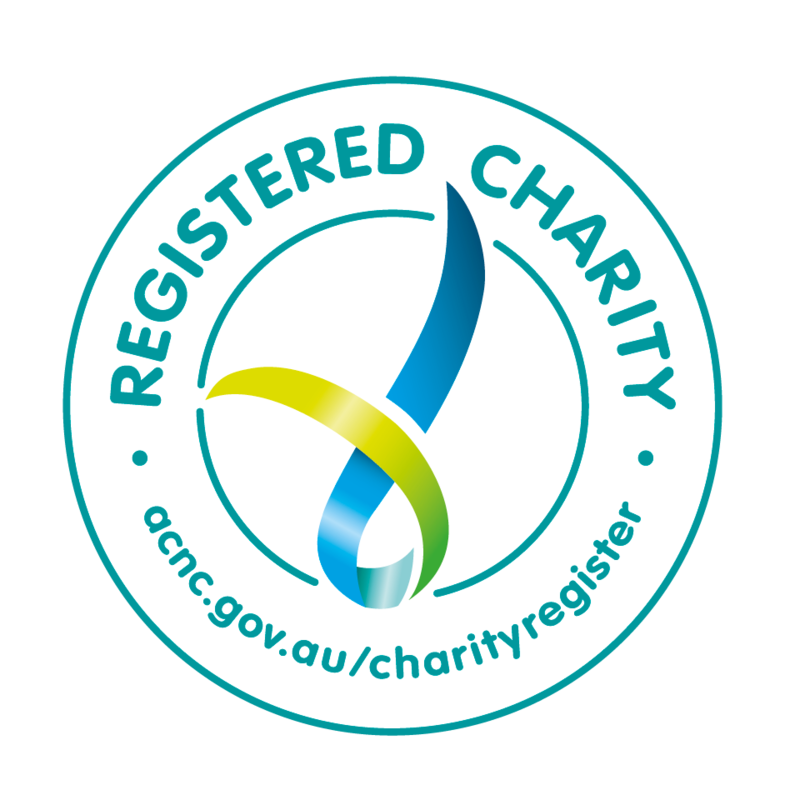 Thank you for following our journey and providing the financial and emotional support that you do. We appreciate it, and we couldn’t do it without you.